In a rare move, Meghan popped out for quick business lunch in Notting Hill on Friday! She dined with her new deputy director of communications, Christian Jones, and sported a casual off-duty ensemble for the occasion. It’s not often we see royals out in the wild outside of official royal public engagements, and it’s even more rare to see the new Duchess so dressed down since marrying Prince Harry last year… this was a real treat for all of us!!! This particular outfit consists of some new items and some old favorites. 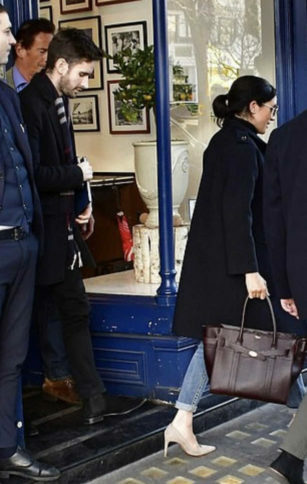 Her Mulberry tote bag and Stuart Weitzman Legend pumps are both pieces we’ve seen Markle wear before, while the HM maternity jeans, Victoria Beckham Power Frame sunglasses and yet-to-be-identified navy military coat are all new (at least to us)! While the coat hasn’t been identified, I did find this very similar style on sale for under $250! Her shoes are no longer available, but Stuart Weitzman has this nearly identical pair of pumps in a similar neutral hue. Her HM maternity jeans are also sold out, so I linked a similar non-maternity pair in below!